A fundraising cycle race in memory of Islandmagee footballer Stuart Ross returned at the weekend. 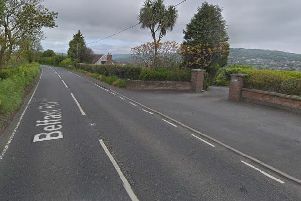 Just under 80 cyclists took part in the event on Saturday, December 30, following a 20-mile route around Islandmagee with the option of a seven hill challenge. The event started off at Whitehead Fire Station. Stuart was playing his first match for the club in September 2013 when he collapsed. The 25-year-old received medical attention at the scene, but sadly he could not be revived. A total of £1400 raised during this year’s race will go towards mental health charity, MindWise along with Northern Ireland Chest Heart and Stroke. Commenting on the event, race organiser Noel McKee said: "There was a lot of snow and ice around the country so we had much lower numbers taking part - just under 80. "It was incorporated into the Fire Service's Healthy Body, Healthy Mind campaign with MindWise and CHS to raise awareness of the importance of keeping our physical and mental health in good shape. "We lifted £1400 which was a fair effort given the much reduced numbers." Just under 80 cyclists took part. Braving the cold for the charity cycle challenge.